to keep dinghies from grinding on a coral-strewn shore at low tide. in the background on Hunga Haven’s mooring ball. 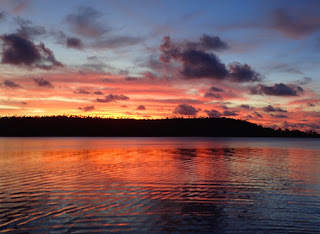 Hunga Haven is an apt name for a sweet, incredibly well-sheltered spot in Hunga Lagoon in Tonga’s Vava’u group of islands. 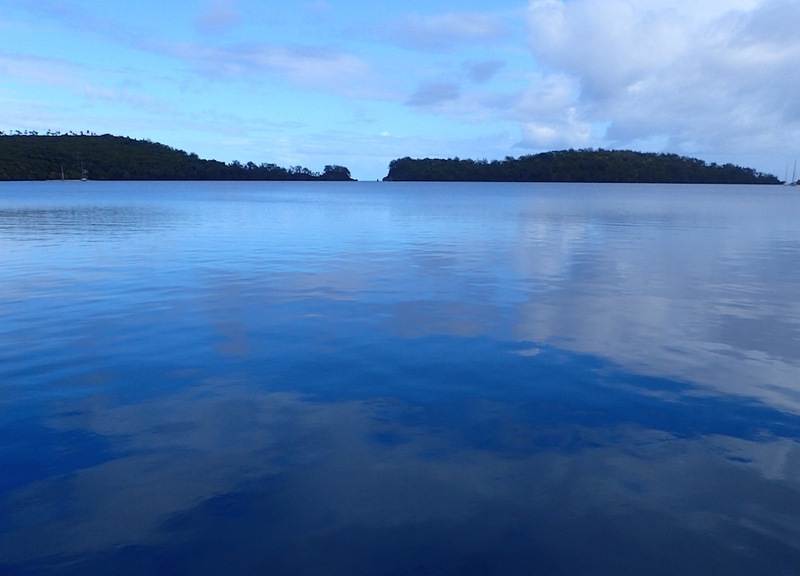 Bowl o sky, mirrored in Hunga Lagoon. 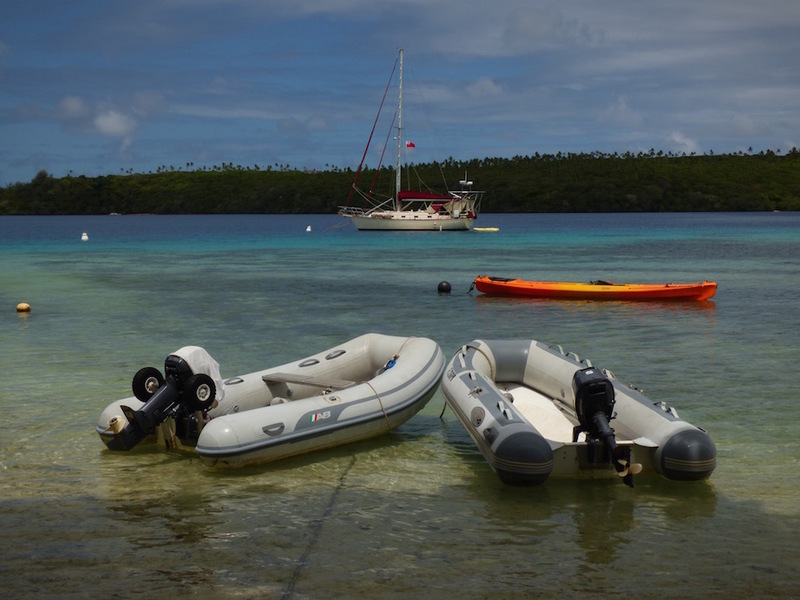 Friendly former Canadians Barry & Cindy provide a robust mooring ball, with more planned, along with wifi* and whatever advice cruisers want to make the most of their time tin the Hunga area. Hunga Haven is slowly working their way to eco-resort-hood, with one small fale already built with native materials. Additional additional fales are in the works. 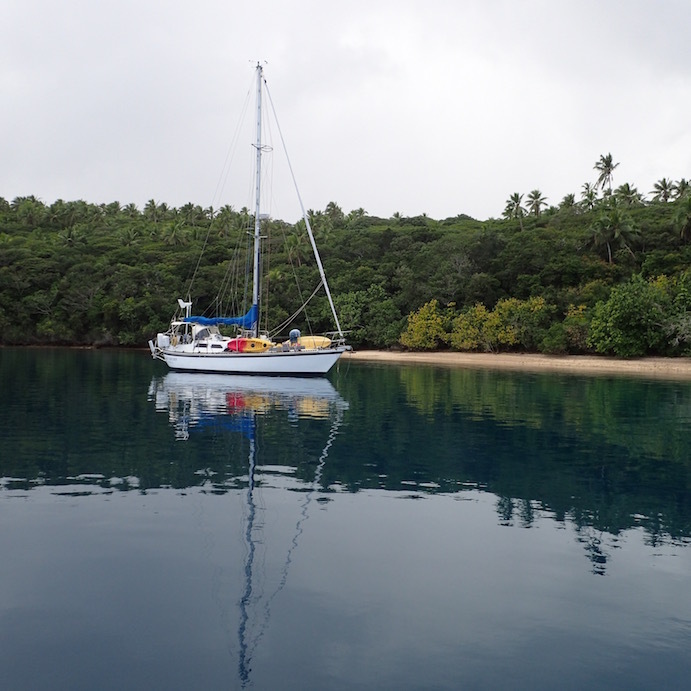 of the Hunga Lagoon anchorage we shared. *To access wifi, for 5 TOP/hour (about $2.50 USD) requires a clear shot at Hunga Haven’s antennae. At the lagoon anchorage around the corner, even with our repeater we were unable to access wifi at our boat. Barry suggested hanging out on the beach or his porch; our cruising friends Patty and Steve graciously let me crash on their boat, which was on the Hunga Haven mooring ball for my wifi time. 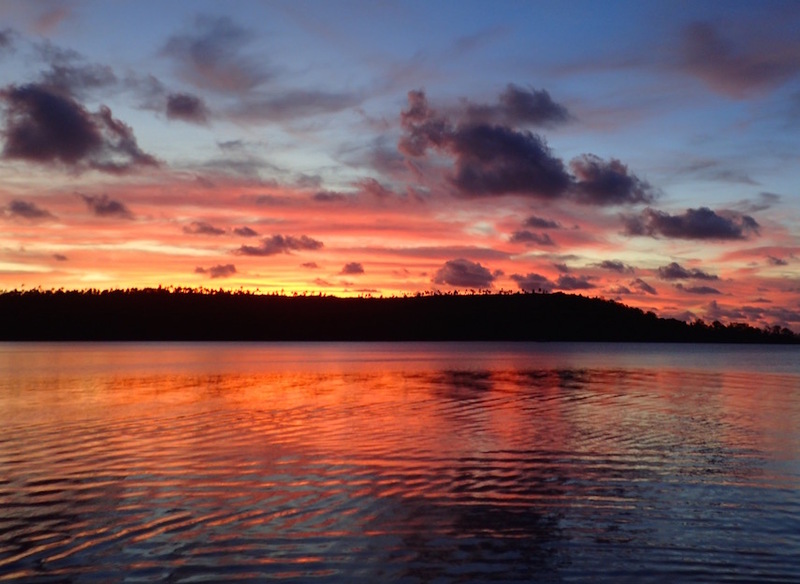 Sunset panorama in Hunga Lagoon from Journey’s bow. 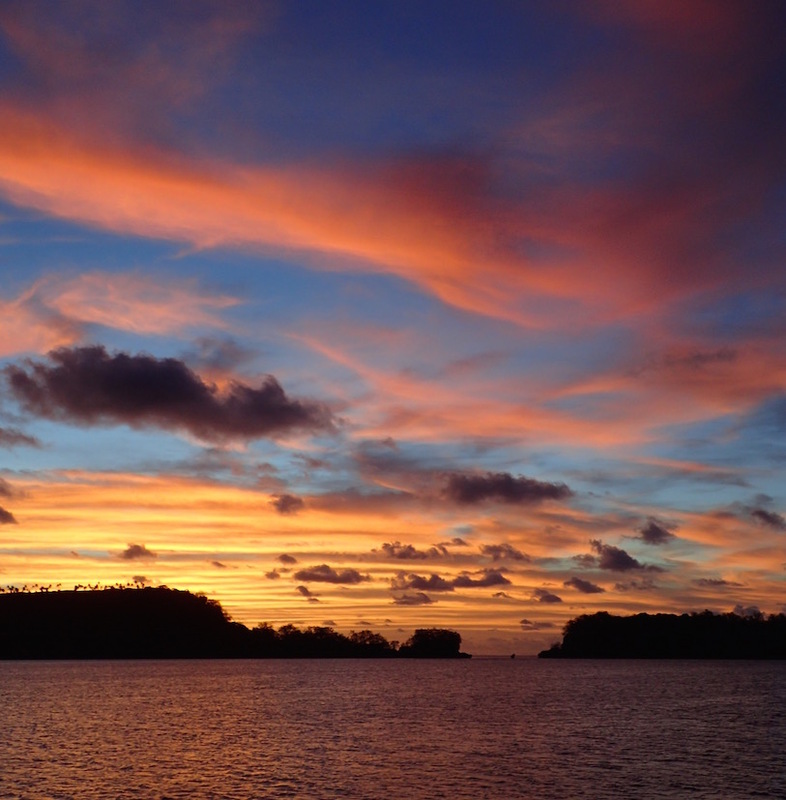 Hunga Lagoon’s entry silhouetted beautifully at sunset. Heckuva a welcome our first night! Hiking, snorkeling, kayaking and just general lazing about in an incredibly beautiful and peaceful spot are all great reasons to make at stop at Hunga Lagoon. 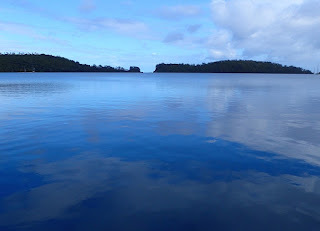 Instead of awakening to party music or roosters crowing, in Hunga Lagoon, we were awakened gently, by songbirds. Sunset just kept getting more and more dramatic. Do come fully self-sufficient! Even though Hunga’s village is second in size only to Neiafu in Vava’u, there are no stores, groceries, restaurants or bars. Locals take the ferry to Neiafu Monday, Wednesday or Friday to fulfill their shopping needs.